inagawa cemetery is located on a steeply sloping site in the hokusetsu mountain range of the hyogo prefecture, approximately 40km north of Osaka. 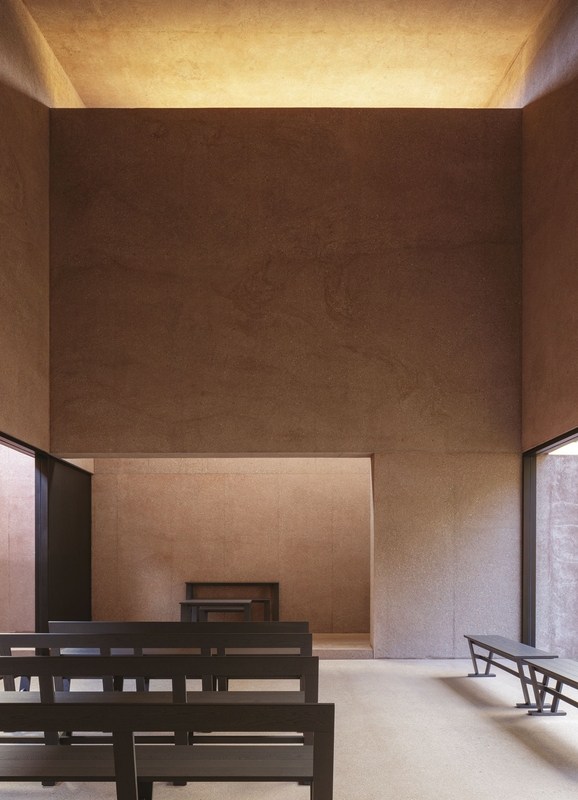 the boenfukyukai foundation commissioned david chipperfield architects to build a chapel and visitor centre for the cemetery. 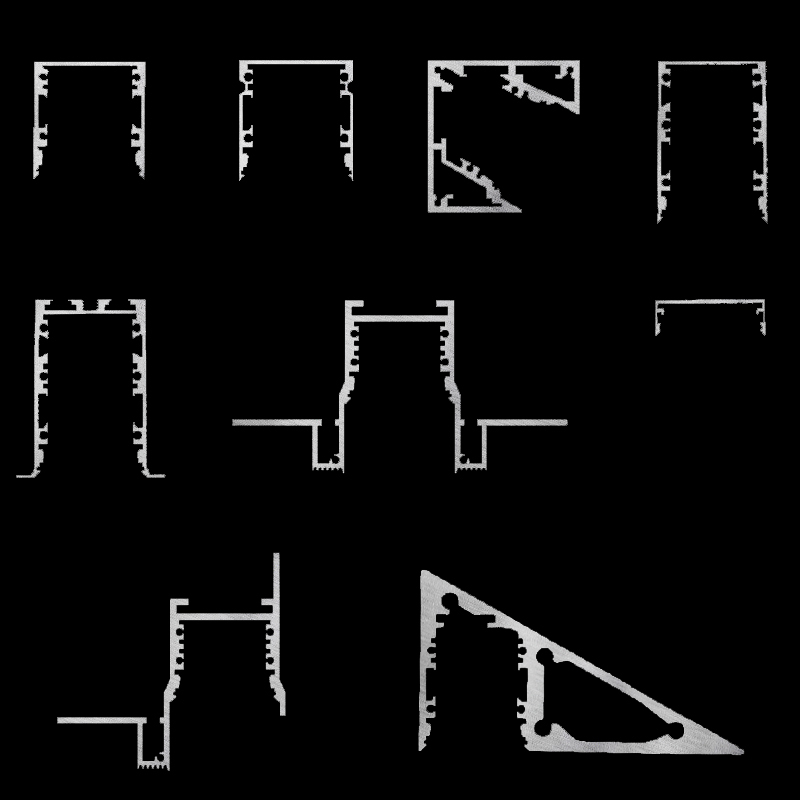 the cemetery is laid out across terraces and bisected by a monumental flight of steps leading up to a shrine at the highest point, an axis that orients the whole project. 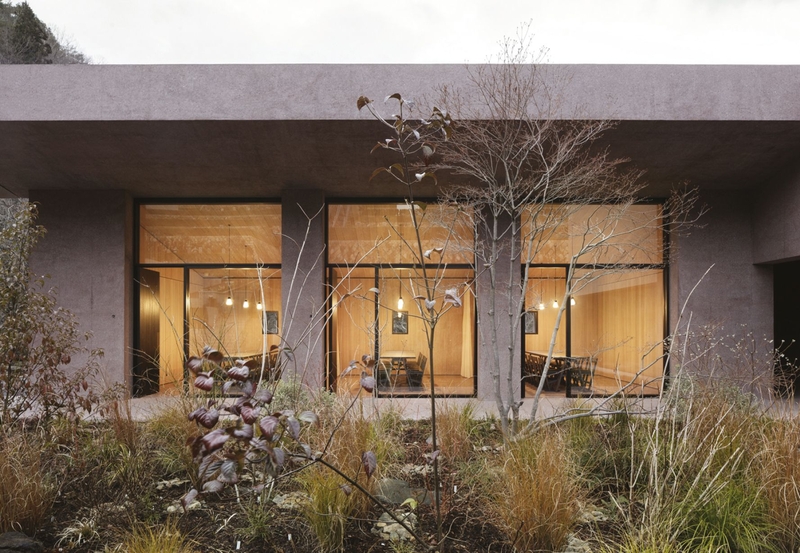 the visitor centre and chapel are designed as a threshold between the outer world and the quieter, contemplative space of the cemetery. a single sloping roof plane follows the line of the hillside and shelters a non-denominational chapel, visitor centre and a memorial room, all grouped around a secluded central courtyard. the rooms of the visitor centre open onto the courtyard garden, while the secluded chapel remains separate. this can be reached via a discrete corridor, directly accessed from the outside or up a ramp from the garden. an unadorned and quiet room with minimal heating and artificial lighting, the chapel offers a contemplative space, pure in its form. relying on indirect sunlight from the gardens on either side, inside the chapel the visitors find silence and can take a moment to pray. their focus is drawn to the rhythms of time through the natural indicators of fluctuation in daylight and seasonal changes in the foliage. the memorial room, which can be divided into three smaller rooms by pleated curtains made with washi paper and fabric, offers space for formal feasts after rituals. 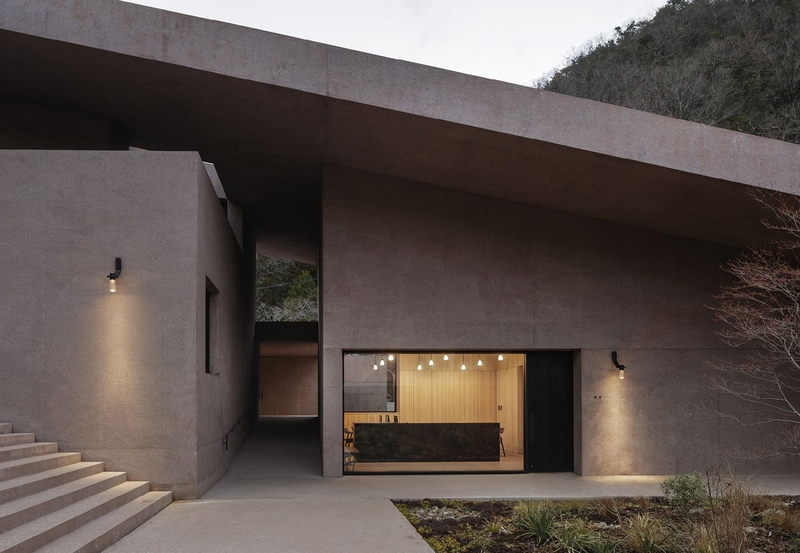 the floors, walls and roof are formed as pure building elements and poured from the same earth-like red coloured concrete —polished for the internal floors and ground and sandblasted for the walkway walls and soffits— giving the overall structure a monolithic appearance. 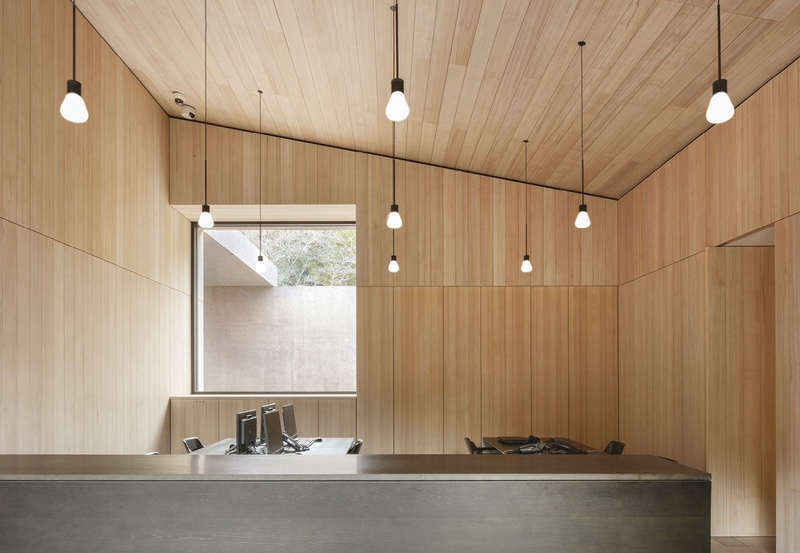 Viabizzuno and david chipperfield architects have created an exquisitely pared down, subdued lighting scheme for this contemplative space. the lighting solutions were studied over a number of years as the building developed, allowing the design to evolve. although the visitor centre has a homogenous appearance, the spaces within have different functions and required specific solutions. combined with this need to accommodate moments of life and prayer, a common language of lighting elements was essential to tie the scheme together. 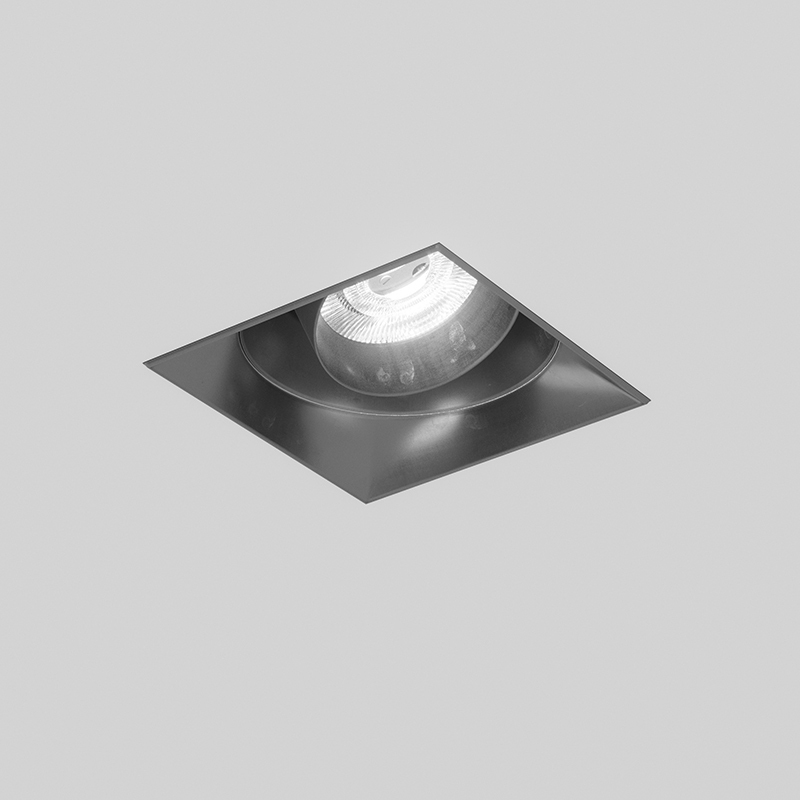 Viabizzuno’s n55 system was selected to provide calm, discreet lighting throughout the interior. inside the chapel, for example, n55 luminaires integrate with the architecture in order to create a peaceful, still atmosphere. the memorial room features a more utilitarian scheme, with the n55 sospensione light fitting, with glass shade designed by mario nanni hm02, adding to the composed, tranquil feel, while ensuring continuity. the exterior areas required a bespoke solution. 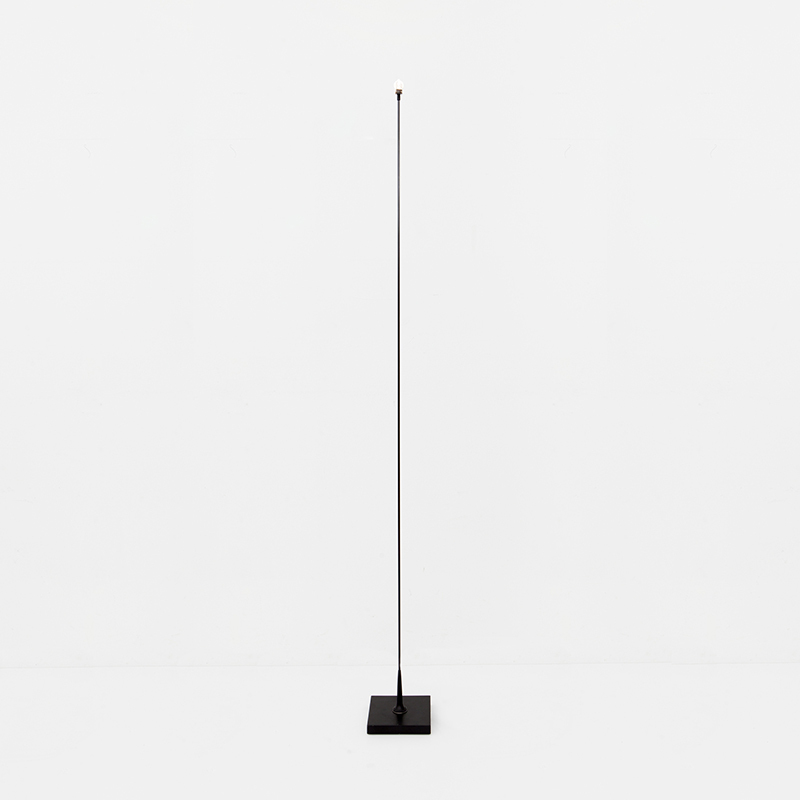 in collaboration with Viabizzuno, david chipperfield architects developed a new luminaire. taking its name from the latin verb meaning ‘to be in silence’ the silère combines elements of the n55 range with references to the architecture of the space. 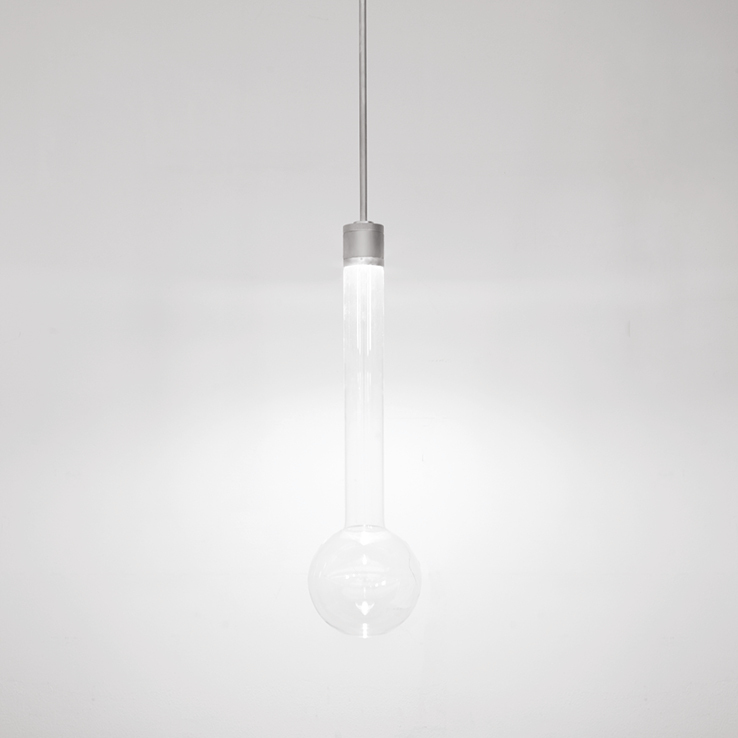 its form creates a uniform and intimate light, which perfectly matches the spirituality of the visitor centre. silère: from latin sileo, to be quiet or silent. silère refers positively to an idea of silence as a form of conscious communication, as a sign of respect for the thoughts of others, in contrast with being quiet which implies an impose silence. the greek etymology of the word is different in nature. according to greek mythology syleus, the son of the god poseidon and brother of the good dicaeus, was a bandit who lived in the rich and fertile regions of aulis. the origin of the name, from ancient greek συλεύω which means ‘to rob’, alludes to his bad conduct: according to the myth, whoever passed through his possessions was obliged to dig the vineyards. one day heracles himself passed by there and, like the others, was obliged to work by syleus. the hero however reacted violently by setting fire to the vines and killing syleus and his daughter xenedoce, transforming that chance meeting into one of his numerous demonstrations of strength. 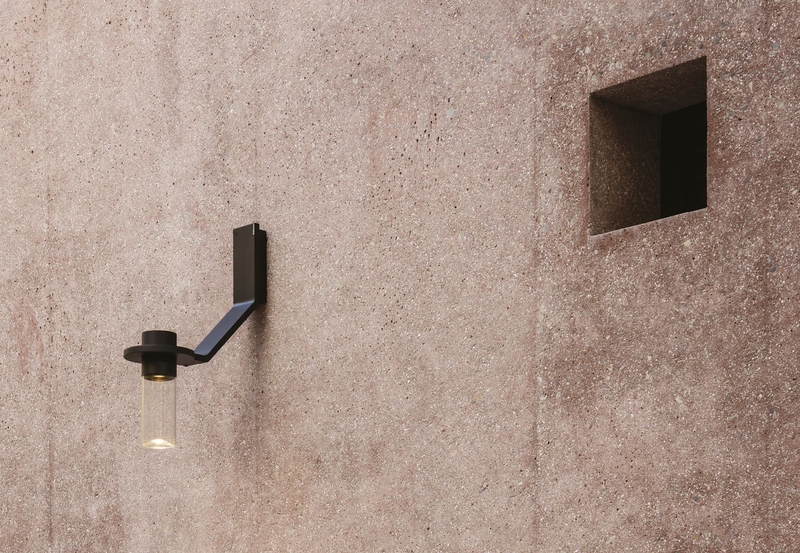 wall light conceived for inagawa cemetery, in hyogo prefecture, japan, designed by david chipperfield architects studio and created by Viabizzuno. 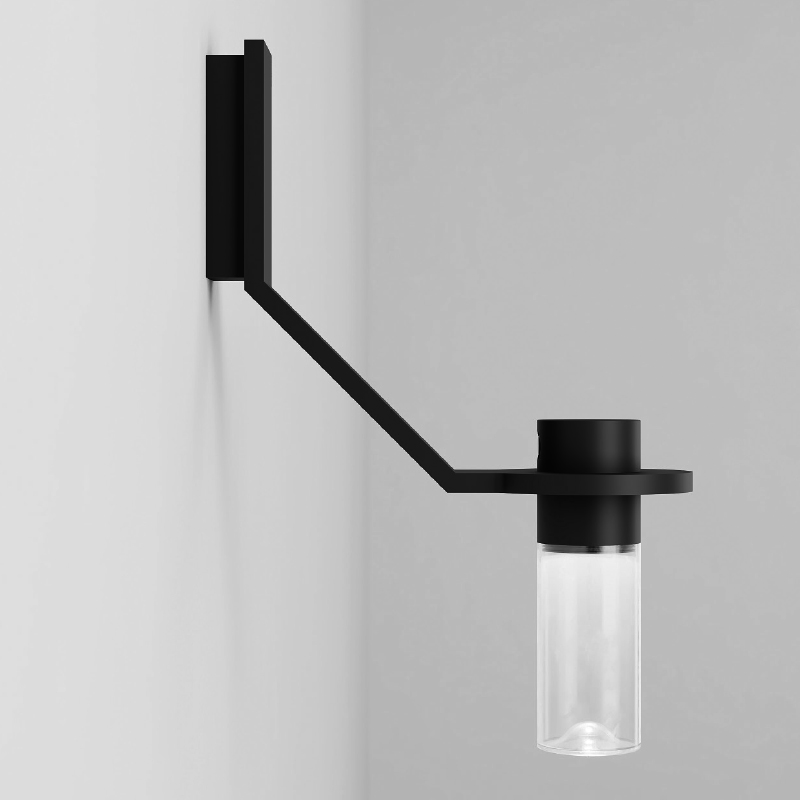 IP55 rated wall light fitting for indoor and outdoor use, consisting of powder coated aluminium body and pirex cylindrical transparent glass, wired with 3000K Ra 95 up to 12.4W 826lm led source.